'Tis the season for holiday shows. 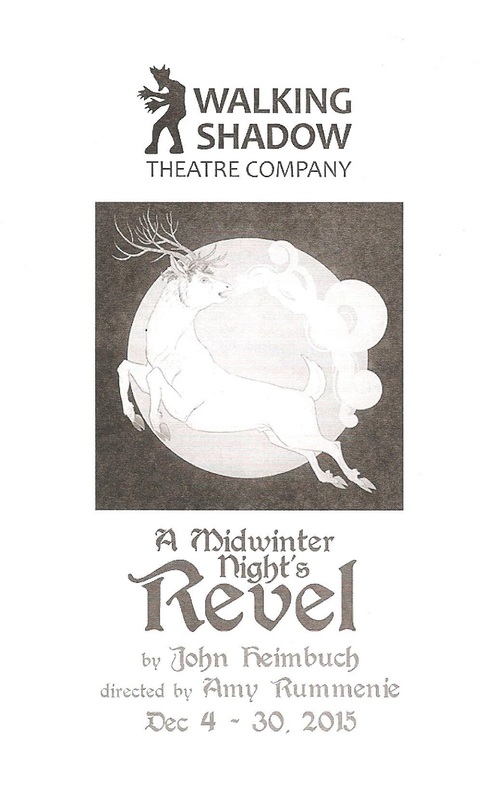 The true and ancient reason for the season is the coming darkness of the Winter Solstice, so Walking Shadow Theatre Company's contribution to the holiday theater season seems most appropriate. A Midwinter Night's Revel, a sort of sequel to Shakespeare's A Midsummer Night's Dream (on glorious display at the Guthrie earlier this year), is a celebration of the darkness of the season, and the waiting and hoping that carries us through it to the sunnier days ahead. In fact this Shakespearean sequel, written and directed by Walking Shadow Artistic Directors John Heimbuch and Amy Rummenie, respectively, is so successful in recreating the characters and tone of the original, albeit it a bit darker and more bittersweet as appropriate to the setting of WWI-era England, that I wonder why we haven't seen more such sequels. I suspect it's not as easy as the cast and creative team of A Midwinter Night's Revel make it look. It may be true that it's hard to be the Bard, but you wouldn't know it from this delightful show. 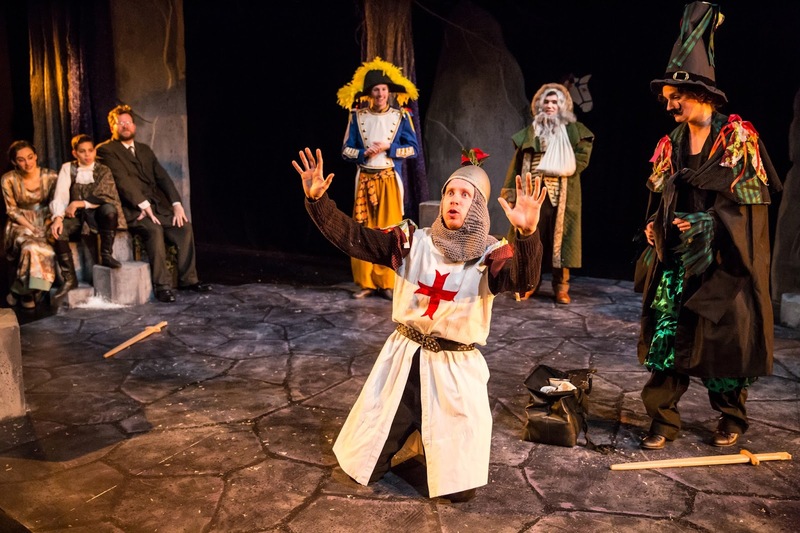 Since this play takes place some 300 years after Shakespeare's original, the only surviving characters are, of course, the fairies (and those who live in the fairy realm). 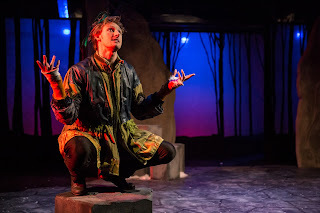 The mischievous and impish Puck (a sprightly Neal Beckman), the elegant and regal fairy queen Titania (Heidi Fellner), and her fairy king, the proud Oberon (Daniel Ian Joeck) are all very recognizable to those familiar with Midsummer. But they seem to have learned their lesson in messing with human lives, at least somewhat. The boy they fought and continue to fight over (the adorably dimpled Jaxon Lindsey) befriended a human boy some years ago, who lived with the fairies for a time and learned magic that he took with him back into the human world, along with a magic staff. Now a grown man (Peter Ooley), this magic continues to protect his family, including his daughter Gwen (Jessie Scarborough-Ghent) and her husband fighting in the trenches. Gwen's friend Arthur (Zach Garcia) has recently returned the war and is suffering from what they used to call shell-shock, that we now know as PTSD. His first spark of life is wanting to put on a mummers play, recruiting his sister Clara (Shelby Rose Richardson) and friend Will (Eric Weiman) to help. Here we have all the makings of both a Shakespearean comedy (did I mention someone gets turned into an animal?) and a wartime drama. An odd mix perhaps, but it works, and beautifully captures the bittersweet joy of this time of darkness, waiting, and returning light (not unlike the bittersweet joys of life itself). For most of us, the holidays are not all happy happy joy joy all of the time. 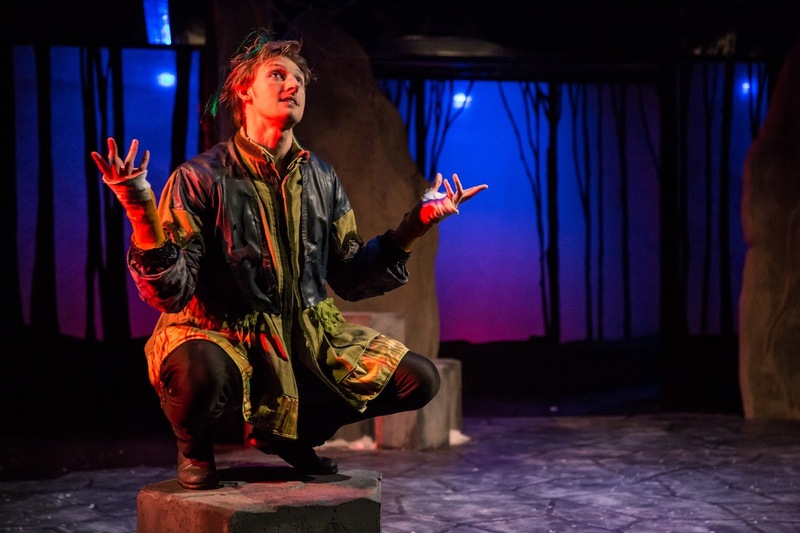 Since this is Shakespeare (ish), playwright John Heimbuch has written the fairy parts of the play in iambic pentameter (or some sort of rhyming scheme, I'm no expert). 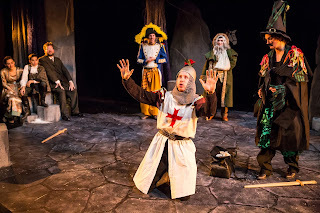 The wonderful cast handles these difficult yet clever and charming rhymes with ease, and with a range of accents. Costume designer Kathy Kohl has in effect designed three sets of costumes that are all beautiful and work well together - the somber wartime wardrobe, the fantastical fairy garb, and the colorful and over-the-top mummers costumes. Rob Jensen's set design has a cold and wintery feel with hints of fairy and plenty of surfaces for said fairies to climb on (even if the setting is a bit unclear at times). The softly twinkling lights on bare branches complete the look. 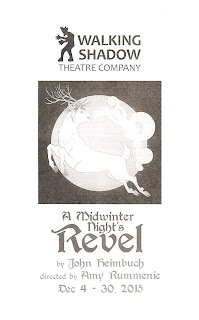 If the holiday season tends to get you down and the usual sugary holiday fare is not for you, A Midwinter Night's Revel might be just the thing you need (continuing at Red Eye Theater* through December 30). *If you're used to parking in the nearby school lot when you go to Red Eye, be aware that it's now off-limits and cars have been towed. I do not recommend parking in the LPM Apartments ramp; it's $10 for 2+ hours and I exceeded the 10 minute time limit from paying to exiting because there's no signage leading you out of the ramp, and the person in front of me took forever, probably arguing the same thing I had to! Other options are street parking (impossible to find even on a Monday night) or the ramps at the Millennium or Hyatt Hotel on Nicollet.